Maniesh Paul attends screening of his short film, Black Briefcase, presented by SEA at George Mason University. FAIRFAX, Virginia: The voices of domestic abuse survivors are more often than not, suppressed, thwarted, the sufferers silenced into submission. A new documentary drama, ‘Invisible Citizens’, set to release in October, seeks to ameliorate that by showcasing their concerns, amplifying their voices, on celluloid! 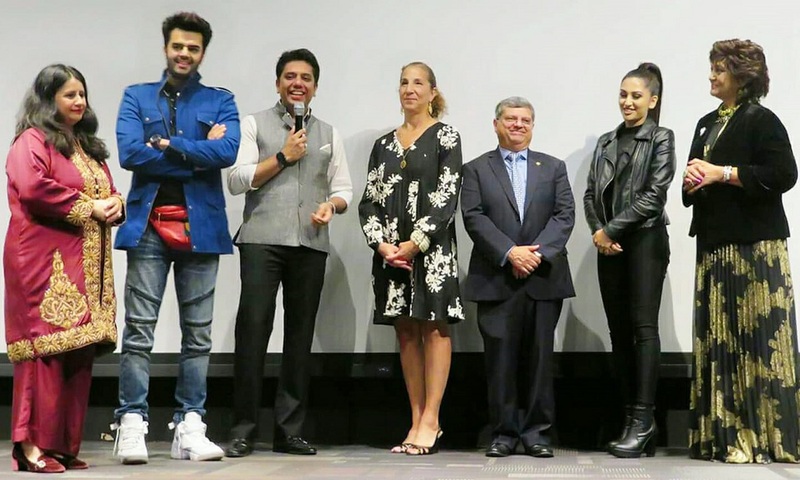 At a launch event held on the sprawling campus of the George Mason University, producer Vevek Paul explained, “In this film, we are just taking the cause of domestic violence” and how it affects immigrants here. Given the magnitude and importance of the issue, the docudrama will begin with three short stories, and ample scope for more to be added. The film is being shot in the Washington area with both male and female protagonists. It is a collaborative effort by a Mumbai-based production company, Cinema addicts 9, and the Society for Enrichment of Asians (SEA), a non-profit organization based in Virginia. Vevek, who heads Cinema addicts 9, told us, “In all the three stories that we have taken up in this film, in some way there is a discord between the couple. The reason why we are showing only one side (intimate partner violence) for now is because it is something that is going to be a process. It is not something that is complete right now. We will be presenting more stories. This is one flower in the whole bouquet that we will be collaborating on over a period of time. For us, in the production house, we are looking for interesting stories to tell. That is what catches our fancy”. He divulged that one of the stories in the film focuses on “a guy who comes from a different part of the world to America” and the hardships he faces. “It is a multi-cultural world as we all know, but what is right on the other side of the globe may not be right on this side”, he said. “The law in this part of the world is much stronger than probably in the other part. When immigrants come here, they might not know where to go for help”. Seema Sethi, President of SEA, added, “One more thing that we have highlighted in the film is that when you come from different countries or different cultures, there are certain laws, values which are different and they may be right in any other country. But, when you move to the US, you can violate the laws without knowing it and that puts you in a lot of trouble”. On hand at the launch event was celebrity guest Maniesh Paul, Indian television host, anchor and actor, whose short film ‘Black Briefcase’ was screened for the Washington audience. The film, produced by his brother Vevek, explores the mind-set of a terrorist. Maniesh plays a dark character – intense, brooding, silent, a far cry from his witty self. Following the screening, he told the audience, “You saw me in a different light. Generally, I make people laugh. This is the first time, I make people think”. Maniesh has acted in Bollywood films, all in the popular comedy genre. “I was looking to be more creative”, he said about his role in Black Briefcase. “I’ve never done a short film. I had a great time. I would definitely like to do this kind of work in the future”. Vevek explained that “the film conveys a larger message. It is not only about terrorism. It is about a mind-change, a change of heart. That is the kind of cinema we are making under our production house”, he said which he runs with Maniesh. “We want to make films which have a larger worldly message. That is where ‘Invisible Citizens’ fits in very well”, he added. On a lighter note, he quipped, “Is it coincidental that my first film has no dialogue and my second film is invisible”? Virginia Delegate Marcus Simon (District 53) presented certificates of appreciation to both the Paul brothers for their collaborative approach and innovative techniques in film-making. Simon, a Democrat whose District encompasses parts of Fairfax County and Falls Church, extolled Sethi “for raising the profile of the issues of domestic violence in all communities in Fairfax and Northern Virginia. The work you are doing is invaluable and very helpful”, he said. Vevek recalled that he met Sethi for the first time in an elevator when he had come for the Dabangg Reloaded concert in July organized by Elite Bollywood Entertainment in Washington, DC. He described her as “a very perseverant women who started talking about her project immediately” and “was very adamant that we make the film”. “The stories that she told were very heart-touching. As a film-maker I got interested only because the stories had a connect of emotion. That’s where I connected with the whole project”, he said. As Vevek started to work on ‘Invisible Citizens’, he realized “these stories are universal. She (Sethi) was narrating incidents that have happened here, but these kind of stories happen everywhere”, he said. “The concept of ‘Invisible Citizens’, bringing it on a bigger screen and then taking it to the right authorities is a very noble thing to do”, he averred. “There are people who are suffering because of domestic violence. I believe education is very important. A lot of times, people don’t know about these things and who to go to. So, these stories are very important”. The statistics on domestic abuse are staggering. The New York-based Sakhi for South Asian Women, an organization dedicated to ending violence against women, states that 2 of 5 South Asian immigrant women in the US are survivors of domestic violence. Addressing the audience at the launch event, Mumbai-based Ravi Iyer, director of ‘Invisible Citizens’, affirmed that coming to the US to work on such a project “has been a good experience. I do a lot of work with NGOs (non-government organizations) in India and when you look at a socially relevant subject, you need to get under the skin”, he said. “It’s more difficult to explore that with actors, but when you are working with a subject (domestic violence) which is so intense, expecting a person who is actually going through it to say it on camera is more difficult. So, we didn’t want to do that, but at the same time, we didn’t want to make it look wrong”. Iyer continued, “We are treading a very thin line. It’s a balancing act. It’s looking cinematically nice and at the same time, it’s looking real because it’s about real people, it’s real stories. So, somewhere, it’s an evolving picture. I feel that when we take it forward tomorrow, we might just discover that this goes into a very much larger scale. You might want to do twenty stories next year”, he said looking at Sethi. “Let it reach out to people. Let it connect with people. Let people ask you for help and that will be the day when you know this is working for you”. Commending Sethi for her efforts, he said, “You have a very warm heart. You are a very genuine person. I really hope you can help more people”. Well-known television hostess and producer Mrs. Nilima Mehra, who served as the emcee of the event, implored the audience to support the “docudrama stating the stories of silence” and, in turn, “the cause of domestic violence. There was absolutely no funding involved in making this movie”, she said. “The entire movie is all due to a hard-working and dedicated field of volunteers”. About her organization, SEA, Sethi stated, “It promotes the exchange of technological, cultural, artistic, educational, social and civic engagement. It also fosters friendship between people of American and Asian cultures”.